Yeah earlier would be better for me too. how about 12.30-1.00? Sounds great!..good for high noon or earlier if that suits you guys? The weather man says only the occasional lite shower for tomorrow! Nothing like today or what's a coming tonite. and myself are hittin' it up this Saturday arfo. Anyone keen to join us? I'll be there from around 2ish. Marty Kent from Melbs, Hotslide,Ollie,Crusty's and i hear Grinderman may put in an appearance! I havnt been there for ages, might see if i can make an appearance. Anyone keen for a roll this Saturday? whlist the weather's onside...and before the dirty end of winter arrives! that was a great day out yesterday lads, so good to see the sun again. Larry you better land this next time round cos I want to use this pic!! Props to Shanas who was going off and Crusty for pushing those frontside's further every time. I like that Midland ramp, was good to skate somewhere new. 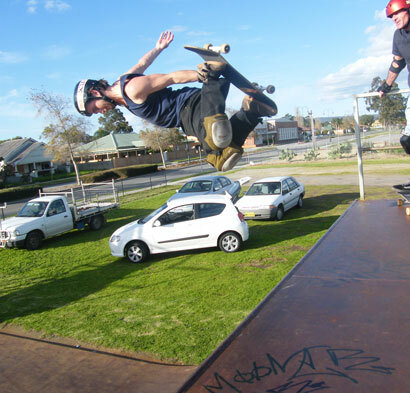 Yeah wicked day, love the method Larry but there was one more tweeker you nailed on the other side of the ramp that was sick i dont think it was on camera though. How time flies.....It's been four months since a sess at Girra! Olly and meself are going to be there around 4ish if anyone's keen? ?